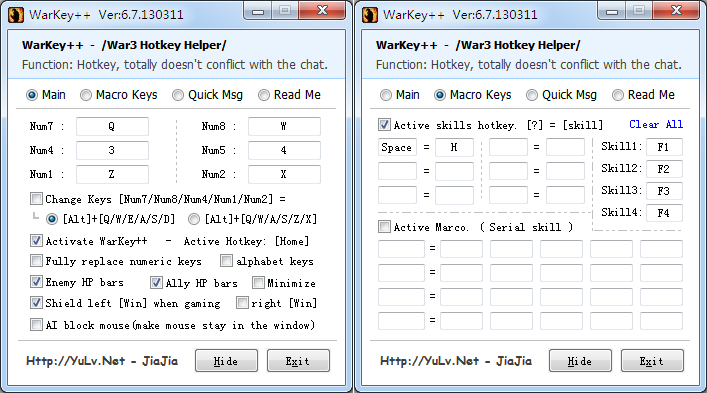 The warkey++ doesn't effect the chat system (will automatically disable warkey when typing) and it is easy to use. Warkey++ is suit to every gaming platform (Garena, Battle.net). Warkey++ is suit to professional match. ( Alt+P ) Hotkey: Pause/Resume "game"
1.This program supports the latest War3 1.26patch. 5.Very simple and nice interface. Strong function. all you need is just warcraft3 (1.20-1.26). Perfect running in Win7/Win8 system, just like running in XP. You don't need to select "Run as administrator". Hi, thank for your tool, this tool is excellent, I always use WarKey when I play DotA. So that, can you add a new feature "Disable Mousewheel zoom" in WarKey? WarKey is simple change key tool does not provide the mapping function of the mouse. WarHelper can achieve what you want, but this tool has not translated into the English version.And other time I can specifically to do a WarKey enhanced version for you to choose. Thanks for this amazing tool. But I always have problem with Shift key, after I use Shift to do a chain of actions with items(hotkey). I can't use that hotkey anymore without Shift. Can anyone give me a solution? What you say is right-clicking skills mean? hi jiajia, can you add more "quick message" for this warkey ? i have a bot with many commands, so i want to do one click to create a command with this tools. thanks for this update. a compatible version in windows 8, but sad to say my antivirus gives error in downloading the file, a virus has been found in the file... pls confirm. i am using Avast! Free Antivirus 8.0.1489. The principle of this software is the keyboard hook, some anti-virus software will be mistaken for malicious programs. Please Create English Ver Maphack. Foreign need this software people more? why i cannot use my warkey even I download many time? You can not specifically talk about how to use it? y the browser said tat the file is malicious? Can you make this warkey exe run WITHOUT administrator privilege?